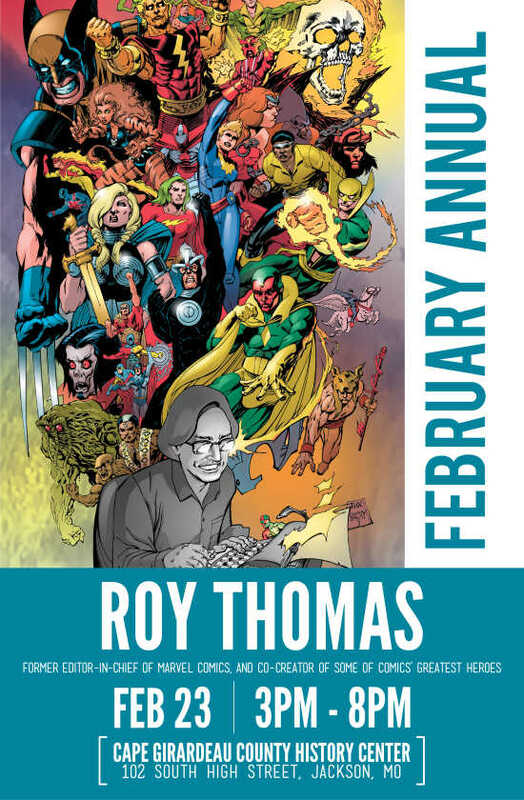 Join us in Uptown Jackson for the 4th February Annual: “A Hometown Celebration of Roy Thomas.” Meet the former Editor-in-Chief of Marvel Comics, and Co-creator of some of Comic’s greatest characters like Wolverine, Conan the Barbarian, and many more. Thomas will give a presentation at 1:00 p.m. at the Montgomery Conf. Center, west Main Jackson. Reservations are required, free tickets at UJRO.org. From 3:00-8:00 p.m. the public is invited and all of Uptown Jackson will be a buzz with a reception for Roy Thomas at the History Center, 102 S. High, a biographical exhibit Opening, special window displays, merchant specials, a Comicbook Pop-Up Market, and so much more. For more information call: 573-979-5170, or visit the Cape Girardeau County History Center or Uptown Jackson Revitalization Organization on Facebook.